The new book by rheology specialist Thomas Mezger! Applied Rheology is primarily aimed at users of rotation and oscillation rheometers. Embark on a journey of discovery with Joe Flow down Rheology Road. Your stroll begins with ideally viscous liquids through the suburbs of viscoelastic materials to arrive at ideally elastic solids. Along the way, Joe Flow provides many insights and practical tips for making meaningful measurements. 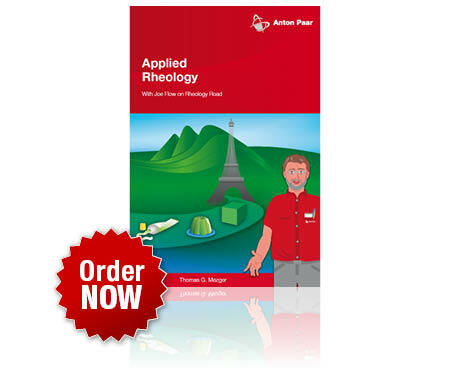 You'll find a great resource in Applied Rheology, whether you're a newcomer or an experienced user. Thomas Mezger finds a clear and entertaining way to describe the laws of rheology and how they can be applied to samples from key industries, including the construction, polymer, coatings, pharmaceutical, and food industries. *Currently valid price for orders in Austria. Prices in other countries may vary. Price valid until cancellation. Please contact support-rheo[at]anton-paar.com for further information.